Up until recently, had you told me that longtime Italy pasta maker Giovanni Rana was serving up fresh artisanal-filled pasta in New York City (which they’ve been doing quietly in Chelsea Market since last November) my reaction would have been “so what?” as I had pretty much had my fill of artisanal-filled everything. That is, until this past Sunday, when the artisans filling some of that pasta at Giovanni Rana Pastificio & Cucina were me and my three children. During the class “Pasta-Making for Kids,” offered at the restaurant on Sundays at 10am year-round, you and your child will get exactly what’s promised in the course offering: an hour of pasta-making instruction followed by a pasta lunch (about another hour) for $70 per grown-up-child combo (plus $35 per extra grown-up, $25 per extra child). The restaurant is also exactly the way it looks in photos: chic and warmly cavernous, with lots of exposed brick and hanging copper pots. Fresh pasta making is very hands on. If you and your kids like getting your hands dirty, you’ll be hooked from the first seconds of making your own dough – shaping a well of flour on your marble cutting board, breaking a couple eggs into it and blending the ingredients with a tiny bit of salt. Fun fact: Since this dough doesn’t have yeast, you won’t make it tough by over handling it. And that’s a good thing, as kneading the dough with the heel of your hand and flattening it with a rolling pin is a big part of the fun. You’ll get better as you go. While she frequently apologizes for her bad English, Antonella comes out with some pretty pithy sentiments, such as “fresh pasta is a learning curve. Every time you do better.” And in fact, your skills do improve as you progress from crafting your dough to cutting and filling two kinds of mascarpone and ricotta ravioli – one made savory with the addition of ridiculously good parmigiano, the other rendered sweet with chocolate. A highpoint of the class – especially if you’re visiting town and can’t bring your pasta home with you – is savoring the scent and taste of the pasta fillings, which you can unabashedly snack on as you work. Food allergies are accounted for. As my kids have shellfish and peanut allergies among them, the restaurant took pains to assure me that our ingredients hadn’t been exposed to shellfish and that the hazelnuts ordinarily used in the chocolate filling were omitted for our class. Antonella will work around other food allergies, too, using one of the kitchen’s vegan pastas if you have an egg-allergic child. A gluten-free pasta is also in the works for the restaurant’s menu and classes. Making pasta isn’t scary. 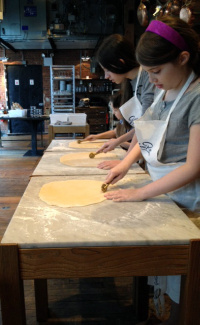 While there is indeed a learning curve when making fresh pasta, you’ll be delighted to hear your kids say that the basics of making pasta are easier than they thought, and that they’re looking forward to trying it at home.